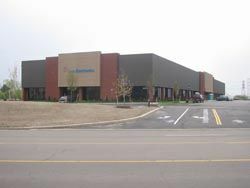 Elo TouchSystems' new 42,500-square-foot facility in Rochester, NY.HARRISBURG, PA-Tyco Electronics has opened a new 42,500-square-foot facility in Rochester, NY. The office, manufacturing/engineering and warehousing complex will house Elo TouchSystems' expanding Custom Solutions Group (CSG). Elo's president, Mark Mendenhall-who officiated at the formal opening celebrations on October 14, 2007-confirms that the move into larger premises is the logical next step for Elo's Custom Solutions Group. "The group has experienced sustained growth," Mendenhall explained, "and literally spilled over from its previous location. We are happy to make this commitment to the continued development of this important aspect of Elo's business." The 12,500-square-foot office area includes meeting and training facilities as well as a spacious product showroom where customers can see demonstrations of a wide range of Elo custom and standard products. "Everything in the expanded facility is geared toward exceeding customer expectations," said Greg Swistak, director of Elo's Custom Solutions Group. "We can respond more quickly to customer requests, the rapid prototype facility includes 3D printing capabilities and laser cutting of sheet metal, so we can now deliver customer prototypes in a matter of days. Plus, in response to increasing demand from our medical and digital signage customers, we've added an enhanced capability to handle and produce large monitors over 40 inches in size."